From the time I was a young child, libraries have been an important part of my life. In North Vassalboro, where I grew up, there was a tiny library made from a converted cottage that had been hauled by horses across an icy China Lake. 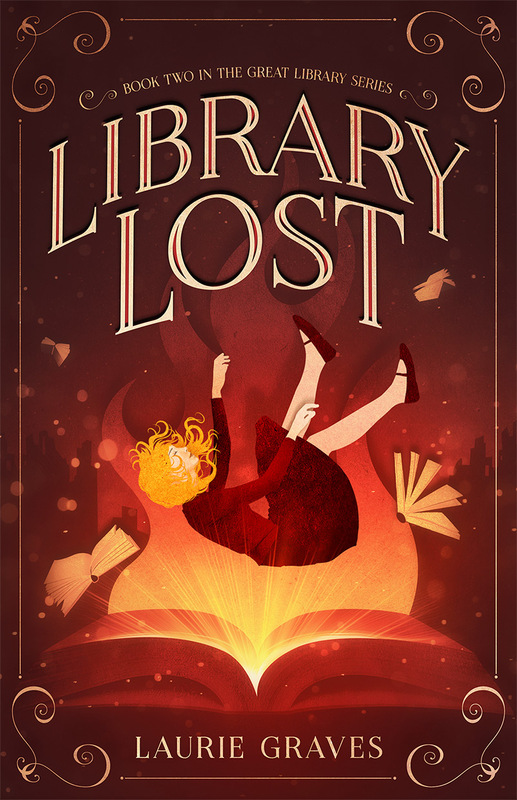 My family regularly went to this library. Once a week, we also went to the Waterville Public Library, a bigger library with a much larger and more enticing selection of books. So I guess you could say we were fools for libraries, and this perhaps explains why I so enjoy seeing other libraries when I travel. On my recent trip to New York City, Dee and I visited two libraries in the New York Public Library system—“the iconic Stephen A. Schwarzman Building,” and the much smaller Hudson Park Library. The contrast between these two libraries couldn’t be greater, but both have their appeal and place. 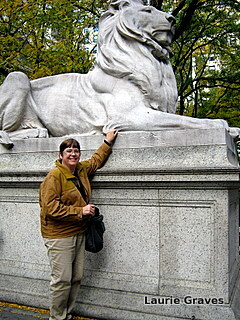 The Schwarzman Building—the one with the lions—is nothing less than a temple devoted to books and words and learning. There are pillars and marble and frescos and chandeliers and statues, and as I tiptoed through the hallowed halls, I looked up, down, and around until my neck began to hurt. I’m sure my mouth was agape as I took in the splendors of this magnificent library. I felt like a country bumpkin in the big city. Is there a more splendid library in this country? I can’t imagine it, but I would certainly be interested in finding out if there is one. At the Schwarzman Building, we saw two exhibits: Over Here: WWI and the Fight for the American Mind and Sublime: The Prints of J. M. W. Turner and Thomas Moran. Over Here illustrated how posters, songs, books, and even movies, a new technology at the time, were used as propaganda to encourage the American public to support WWI. And apparently the public did need to be persuaded. On one side was the progressive activist Jane Addams, who maintained that war “affords no solution for vexed international problems.” On the other side was Theodore Roosevelt, who decried “flabby pacifism” and urged America to join the fight. We know who won that argument. From a historic point of view, Sublime was interesting, but there is no way around it—the prints lacked snap. Both Turner and Moran had a vision of nature that hardly resembles nature at all. With only a few exceptions, the prints were stiff and lifeless yet over the top at the same time. A difficult combination to achieve, but somehow they managed. I’m not sorry I saw the exhibit—Turner’s vivid paintings are completely different from his prints, and I was fascinated by the contrast. Before this exhibit, I had never heard of Thomas Moran, and it is always good to learn about an artist, even if his work doesn’t exactly speak to you. The next day we visited the Hudson Park Library, to see paintings by Elliot Gilbert. 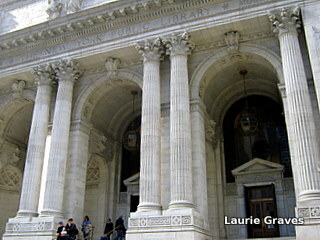 Where the Schwarzman Building is grand and imposing, the Hudson Park Library is small and humble. 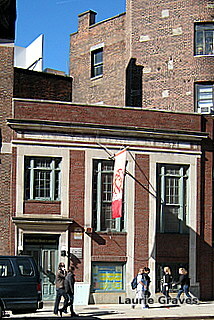 The Hudson Park Library is tucked on a tree-lined street in Greenwich Village. The reading room was small but filled with various people reading and using the computers. It felt cozy and homey and well loved, a community center for Greenwich Village, and while I admired the grander Schwarzman Building, I felt at home in the Hudson Park Library. In fact, given enough money, I could even see myself living in one of those brick homes next to the library, where I would be close to shops and good Chinese restaurants and cinemas that play foreign film such as the terrific Diplomacy, which Dee and I saw after going to the library. Unfortunately, Gilbert’s paintings were shown in a little room where people where studying and reading, and we weren’t able to get a good look at the paintings. But that’s all right. It was still fun visiting the library and walking through Greenwich village, which is much more relaxed than other parts of New York City. A final note: The quotation at the beginning of this piece appropriately comes from a fortune cookie I had the first night in New York. What a fun way to start a trip that was centered on libraries! Previous PostNew York Trip: FoodNext PostSnow, Snow, Go Away!